Mark Zuckerberg, maybe paraphrasing Barlett recently said, "Humans don't understand exponential growth. If you fold a paper 50 times it goes to the moon and back." Amazingly Zuckerberg himself got it wrong; Jason Culverhouse observes, "Actually, it goes to the Sun. I guess he made his point." I'll give Zuckerberg the benefit of the doubt -- he made a mistake and really does have a pretty good grasp of the exponential function. 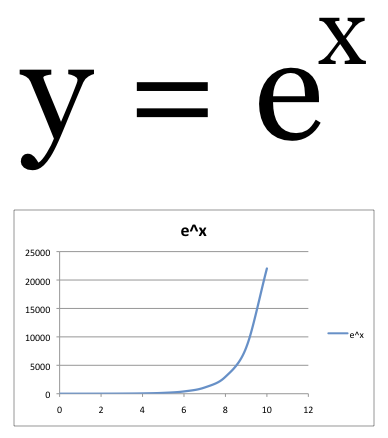 There is no such thing as a knee to an exponential function. I say this with all due respect to Mr. Kurzweil, who is is clearly much smarter than me. When we look at the graph of an exponential function, our visual sensors (ahem, our eyes) seem to fool us. Isn't it "obvious" where the knee of the curve is? In fact, it's not obvious that there isn't a knee. The knee always seem to be at the right "edge" of the displayed graph. In the illustration below, the knee appears to be at a different place depending on the position where we examine x. It's not completely clear to me why we are fooled. But basically, I think it has something to do with the idea that regardless of where your observation point is, looking "left" always looks flat and small, while looking "right" always looks steep. For example, consider where we are at with hard disk drive densities. Today, we see that 1 terabyte hard disks are common place at less than $100. But, 10 years ago, $100 bought you roughly a 1 gigabyte hard disk. That feels pretty small but understandable. Looking back, the curve looks pretty flat, appearing to change only very slowly. In fact, though, it's growing exponentially. Looking forward 10 years, we'll have a 1 petabyte drive for $100. And the pace looks amazingly fast. And it's pretty hard to imagine what a "normal" consumer would do with a petabyte. Still not convinced that there is no knee to the exponential curve? Well, consider when we plot an exponential at log scale. There is no loss of information when we do this. Seems like we should be able see that knee in the curve. But of course, it's line. 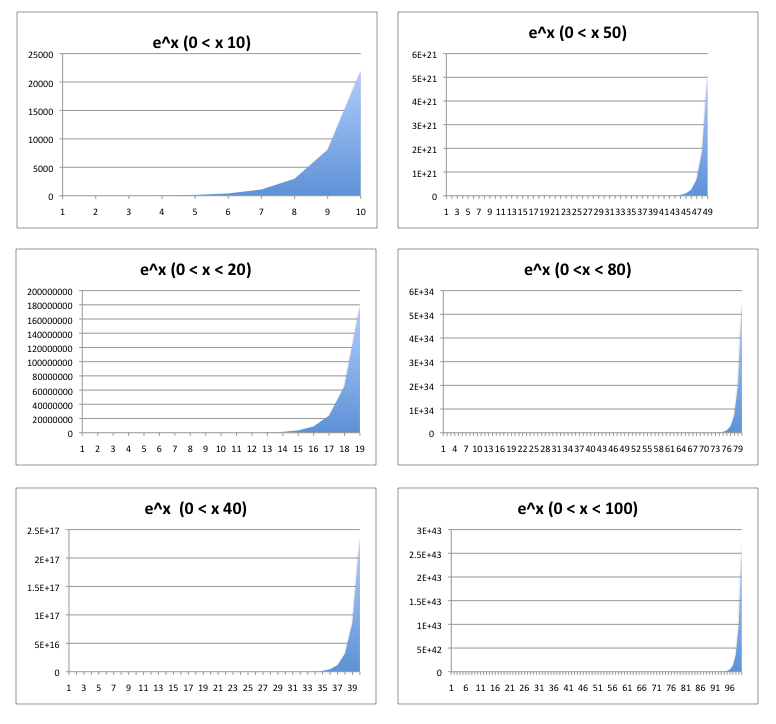 At log scale, the visual representation of the plot log(e^x) = x. At linear scale, it looks like the "knee of the curve" is somewhere around at 18. However, when we look at it at log scale, our eyes tell us nothing. "So what?," you might be asking yourselves. Is this all academic wankerage? Does it matter in any practical terms? Indeed, I think it does. Our failures to understand how fast the exponential function grows might lead us to bad economic decisions. Albert Einstein is attributed with saying that, "The most powerful force in the universe is compound interest" -- a hat tip to the our lack of understanding of the exponential function. And, anyone that has heard the argument why you should start putting money into a 401(k) plan earlier rather than later has probably been told some dubious story about the power of compound interest/exponential growth. And, because the math behind the theory of our economy is based on formulas including exponentials, it's frightening that most politicians don't grok the exponential either. Chris Martenson tells a good story regarding the perilous situation we are in. Agree with him or not, it's good food for thought. Not understanding the power of the exponential will result in us making bad decisions. Finally, the next time you hear some some talk about exponential growth with just a data point or two (or three), be very weary -- such "curve fitting" is an error due to mathematical ignorance at best or deliberately misleading as worst. Last, for entrepreneurs, I'm sure you've run into venture capitalists that are all hot on businesses that are growing purportedly virally/exponentially. And, of course, in attempts to make a good investment, they want to put money in at the "knee of the of curve" (or where the curve "hockey sticks"). "Where is it?" you are asked. You should think carefully about how you are going to answer this question that doesn't quite make sense. It's quite the "gotcha." Hopefully, you have an understanding of the math of the exponential function and why we are often seduced by it. Then you won't be fooled by faulty thinking, and, further, you can build a rhetorical argument around the magic of the exponential function for your own gain. Good luck! Continue reading We Don't Understand Exponentials. 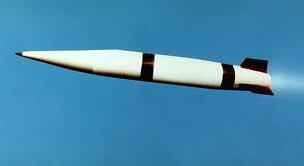 I've been following the news about the recently Iranian hijacked US drone with some fascination. I'm a bit surprised by the lack of coverage -- or maybe not. Perhaps there are sensitivities that haven't been revealed. So maybe keeping it all under wraps is extremely important, even though the information flow is a bit leaky. Many parallels have been drawn between this incident and the downing of a U2 plane in 1962. Of particular personal interest to me, is the navigation (or guidance) system used to guide and direct the drone. It appears that the drone relied on GPS (Global Positioning System) for navigation. Of course, GPS is the same technology used for your car navigation system and all those cool location based services you use on your IPhone. Reports indicate the drone was compromised through an attack vector on the GPS navigation system. (Side note: I've watched with equal fascination how easy it is to compromise your automobile through really unsophisticated attacks.) 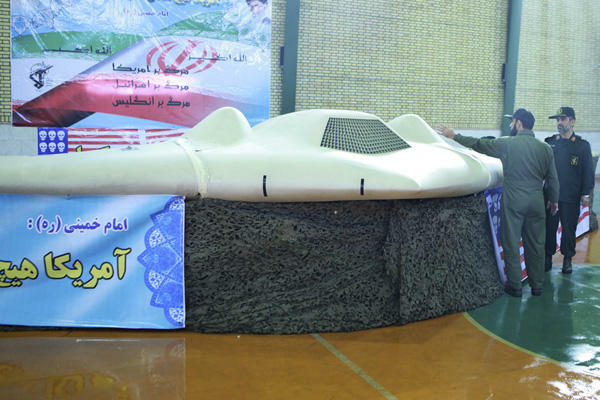 From the Christian Science Monitor Report, Iranian specialists reconfigured the drone's GPS coordinates to make it land in Iran at what the drone thought was its actual home base in Afghanistan. Certainly, if this is true, the security system that allowed access to the navigation system was compromised. So, there is some fault in the design/implementation of that system. The obvious fault lies here. However, stepping back, maybe there's a more strategic design flaw? Serious design considerations for how to build "modern" navigation/guidance system were contemplated probably as early as Sputnik -- the Beep Heard Round the World in 1957. And, as guidance systems for Minuteman, SRAM, the B1, and all commercial airline systems were designed and deployed, an approach that did not rely on GPS was developed. The design goal was to build a guidance system that was completely self contained and thus not reliant on any external systems. In particular, any system relying on GPS was rejected. The fear was that external systems, such as GPS, could be compromised, especially through EMI -- Electromagnetic Interference (resulting from enemy jamming or emissions from a nuclear blast). Such compromises would render the navigation systems useless. So, what was developed instead of GPS for navigation? Basically, math and a spinning top -- a gyroscope. Using a Kalman filter, a gyroscope (to make measurements in the physical world), and a pretty unsophisticated computer (that had less than few hundred bytes of memory) inertial guidance systems were built. Missiles and airplanes were completely autonomous and self contained from external systems, hence insusceptible to compromises to GPS failures or communication attacks on such systems. So, the take away for me today is that sometimes you need to take a step back from the problem you are solving. Look at the big picture. Maybe we're overly reliant on technology. I romantically believe that math is the answer to many problems. Less than a year ago last December, as I'm sure most of you know, my father passed away. 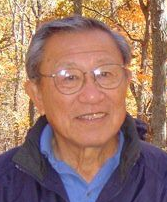 In 2007, he was diagnosed with bladder cancer that had metastasized to his lungs. He went on to live 41 months, fighting a valiant battle. The silver lining is that, I think, he enjoyed much of that time (even though chemotherapy was so taxing) during those months. For me, I spent quality time with my dad and family that under other circumstances I probably would not have. In a strange way, I am blessed for that time. Here's my tribute to my dad: How the Cold War Was Won. Last, I'll never again complain about getting poked in the arm by a needle for a blood draw or immunization. Watching my dad endure getting stuck multiple times a day on top of all the chemo makes me realize what a wuss I was when I was a kid. 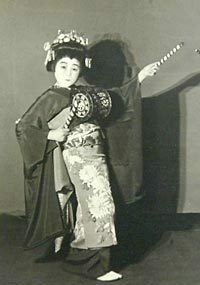 Earlier this year, my grandmother (Yamamoto) also passed away. She was 95. I know she enjoyed life, against the backdrop of trying yet colorful times. Even in the end, she brought happiness to those at Washington Care, with her positive disposition. It was a bit confusing with back-to-back deaths in the family, but a time of great reflection. Please visit us at www.charityblossom.org (and like us on Facebook bit.ly/vKLuCp). If you are making charitable donations online, checkout Charity Blossom to do so. We are the easiest and most efficient way to make charitable donations, we hope you do. While I had left the company in all official capacities (except as a shareholder) more than a year ago, I've remained keenly interested and proud of MerchantCircle, a company I co-founded in 2004. I'm happy to say that we sold the company to Reply in July of 2011. It was a good exit, and I hope the synergy between Reply and MerchantCircle yield even greater value to the local businesses that we serve. Here's what I had to say in a blog post: Like Peanut Butter and Chocolate. Kudos to Ben for getting this deal done. In the light of all circumstances, 2011 has been a good year. I've re-connected with friends, family, and co-workers. I'm glad Mom and Jim are doing well. Charity Blossom is rocking. As for 2012, I'm looking forward to a banner year at Charity Blossom, hoping to see more of all of you, and starting to work of my film project about my grandfather (that's a story for another email). Hope the end of 2011 is good for you and that 2012 is even better!